A mural at Savanna High School showing their mascot, the Rebel. An Orange County school district will consider Monday whether to replace a high school mascot that depicts a Confederate soldier. The move comes after students at the Anaheim school raised concerns about the mascot’s potentially racist connotations. 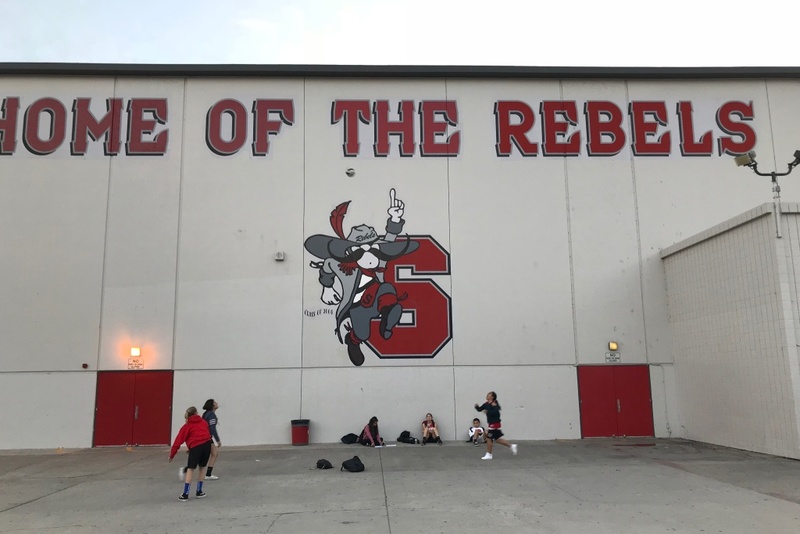 A group of mostly African-American students from Savanna High School, along with parents and community members, approached the Board of Trustees for Anaheim Union High School District in October to ask that the school’s Rebel mascot be replaced. One student athlete told the board he was embarrassed to tell people he went to Savanna, while another said he was considering transferring because of the mascot, district spokeswoman Pat Karlak said. Other links to the Confederacy at the school have been removed in recent decades, including the Confederate flag. In 2015, the district board of trustees voted to demolish a statue of a Confederate soldier that had long stood in Savanna High School's quad. The statue, nicknamed "Johnny Rebel,” had fallen into disrepair and been removed some years earlier, but some community members had asked for it to be repaired and reinstalled. Still, the school kept its Rebel mascot, even as the school's student body became increasingly diverse. Last year, 74 percent of students at Savanna were Latino, 3 percent were African-American and another 13 percent were Asian, Filipino or mixed race, according to state enrollment data. Similar debates over the fate of Confederate monuments and other relics have played out across the nation, sometimes violently. Concerns over Savanna's Rebel mascot reemerged shortly after the white nationalists demonstration and counter-protests in Charlottesville ended in one death. Fred Calhoun, who heads education efforts for the local NAACP, called the Rebel mascot "a symbol of hatred and disrespect” and said it should be replaced. Calhoun said he thought most students probably weren’t aware of the mascot’s link to slavery and white supremacist ideology. They should be aware now. In recent weeks, Savanna teachers and students engaged in a school-wide effort to educate themselves about the Civil War, Confederate symbolism and racial tension in the U.S.
At the end, students took a poll where 74 percent voted to either replace the Rebel mascot or rebrand it. "I believe this could be a teachable moment for the entire country to see how students from a public school can demonstrate how to have a civil and respectful discussion, based on evidence, regardless of opinions,” district Superintendent Michael Matsuda said in a statement. The poll was non-binding but students will present the results to the board of trustees at its meeting. School district officials are also expecting alumni to show up to express support for and against keeping the mascot. The AUHSD Board of Trustees meets at 5 p.m., Monday, Nov. 6 in the Savanna High School Auditorium. Correction: An earlier version of this story misstated the percent of students that voted to either replace or rebrand the Rebel mascot. KPCC regrets the error.